We use the phrase “pain in the neck” to refer to any relatively minor inconvenience in our lives. But as anyone suffering from neck pain will tell you, a neck injury is anything but minor! With so many of us spending most of our days hunched over desks, gazing at computer screens or craning our necks to get a better view of our smartphones, neck pain is on the rise. In fact, it’s estimated that one in 10 adults suffer from stiff necks at any given time! You wake up after a long night’s sleep. You roll over to turn off your alarm and ease yourself out of bed. You turn your head. And then it hits you. A sudden, sharp pain in your neck every time you move your head. Imagine that, except every day for weeks on end. That’s what sufferers of neck pain put up with on the daily. What you’ve just imagined is the most common manner in which neck pain manifests: mechanical neck pain. While the cause may vary, the result is the same: your neck muscles become tight and stiff, oftentimes leading to that distinctive neck pain. There are 23 intervertebral discs that make up your spinal column, six of which are in the neck. Each disc is made of collagen and ligaments and acts as a shock absorber, enabling the neck to handle various stresses and loads. A handful of conditions cause these discs to start drying out, shrinking the distance between vertebrae (the bones that make up your spinal column). Oftentimes, this results in the vertebrae scraping against each other, causing pain. On a related note, sometimes the protective outside layer of a cervical disc tears, causing the soft centre to bulge out and put pressure on your nerves. This is known as a herniated or “slipped” disc. Unlike other sources of neck pain, herniated discs can lead to pain in your back, shoulders and upper arms, too. The second type of neck pain is known as referred neck pain. While rarer than mechanical pain, it’s equally as painful and uncomfortable. This type of pain is not limited to the neck. No, referred neck pain can spread to your arms, shoulders and mid-back. In some cases, it can even cause migraines! Oftentimes, it is the result of nerve compression or inflammation. Oftentimes, it comes with disc problems in your spine causing pressure or inflammation, and can lead to long-term problems if not treated in time. 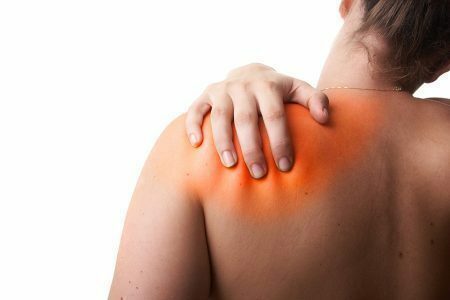 If your neck pain is accompanied by pain in other parts of your body, it’s time to organise a consultation with our Elsternwick physio! As an expert in musculoskeletal conditions, our Elsternwick physio Ben Demase, is your first point of call to diagnose the cause of your pain and determine the right treatment program. We will prescribe a multimodal approach that combines strength and mobility exercises with hands-on treatment, postural aids, and ergonomic tools for optimal results. Gentle, repeated neck and joint exercises are effective ways of eliminating your neck pain. While the exact routine will depend on the determined cause of your pain, various exercises can build strength in your muscles and improve flexibility in your neck, eliminating the risk of future pain. Deep tissue massage and dry needling are also effective tools our physio can deploy. These relax your muscles and relieve tension, reducing your chances of neck pain and keeping your neck limber. Finally, we can prescribe tools to correct poor posture. Aids like back supports, ergonomic cushions and pillows can fight bad posture, one of the leading causes of neck pain. If you’ve been told your disc has ‘slipped’ don’t worry – that’s actually a misnomer. There are many types and sub-types of disc injuries and our Elsternwick physio can treat them as well! Fortunately, surgery is rarely necessary in cases of “slipped” discs, if you’re worried about needing surgery you simply MUST get a comprehensive examination from one of our expert physios. If you do need a surgical opinion they will fully explain to you your options and can suggest the right specialist for you if a referral is deemed necessary. Once we diagnose your disc problem, we will focus first on improving your strength and position to take pressure off the affected disc. This can include taping your neck and back and using a specific protocol designed to help bulging or other disc injuries heal. Additionally, your physio will identify activities and postures to avoid. Once your pain and inflammation die down, we move onto the next phase: restoring your normal joint and neck function. Once again, exercises, stretches and massages build strength and encourage recovery. Our unique AUS System doesn’t just fix your neck pain. We focus on identifying the source of your pain and developing routines that target the specific muscles, bones or tendons. Only then can we tell you exactly how to reach your desired result! The Physio AUS promise ensures that from your very first appointment, we’ll tell you exactly what your treatment will involve, how long it will last, and how frequently it should be. If you’re sick of waking up with a sore neck, book a consultation at our Caulfield South physio. Alternatively, we also offer online consultations so we can “meet” from the comfort of your own home or office!